 Pedicab Driver is currently unavailable on video, save for a VHS release in the UK. The injustice of this act cannot be measured. The Skinny: This movie is all over the place and probably shouldn't be considered a great film. However, for those seeking the eighties definition of Hong Kong Cinema, it's hard to top Pedicab Driver. Classifying this movie is impossible. 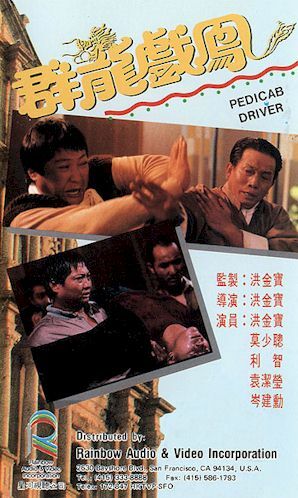 An uneven action comedy, Pedicab Driver exemplifies the type of popular cinema that Hong Kong loved during the eighties. What that means is it's a mismatched series of pratfalls, slapstick, mixed messages, bizarre comedy, heightened emotions, sudden tragedy and yes, incredible fight scenes. Sammo Hung was at the wheel of this truly Hong Kong confection, and he comes through nicely. Many will scratch their heads once it's over, but Pedicab Driver is one entertaining movie. Here's the plot: Sammo Hung and Max Mok play a pair of pedicab drivers (think rickshaws pulled by bicycles) who fall in love with respective females Nina Li and Fennie Yuen. However, wacky problems and unseen baddies arise, along with excuses for much wacky shtick and sudden fighting. That fighting is of the most entertaining variety, including a terrific sequence between Sammo Hung and director Lau Kar-Leung. There are also chases, out-of-nowhere gags (there's even a Star Wars joke), and the requisite shifts in tone. Those shifts are actually quite extreme here. So extreme, in fact, that by film's end you might wonder if you're watching the same movie. Pedicab Driver has rather typical romantic problemsa dreadful secret may prevent Max Mok and Fennie Yuen from finding happiness but they're handled in an expectedly audience-satisfying manner. At least initially. That's right, IT ALL GOES TO HELL, and revenge becomes a major factor. Didn't this start off as a happy-go-lucky kind of film?